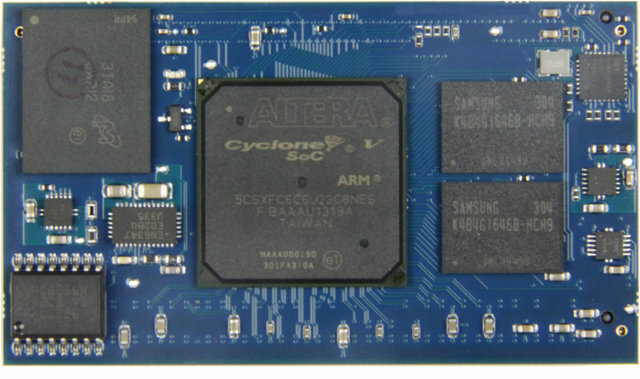 DENX Computer has announced a new systems-on-module (SoM) powered by Altera Cyclone V dual ARM Cortex A9 + FPGA SoCs. DENX MCV SoMs also feature 1GB DDR3, 256 NAND Flash, and various memory interfaces and peripherals including PCI Express Gen2 and high-speed serial 3.125Gb transceivers. In case you wonder how Altera could come up with complicated SoC names as shown above, here’s how to decode Cyclone V SX nomenclature. 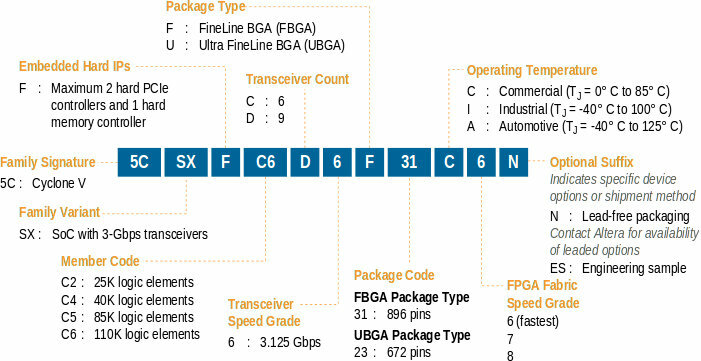 For other types of Cyclone V SoCs, you can refer to the source “Cyclone V Device Overview“. The company will provide support for U-boot (obviously) and Linux via the Embedded Linux Development Kit version 5.5 (ELDK). Documentation specific to MCV SoM is likely to eventually show up on the company’s Wiki. I could not find a carrier board for the SoM, nor an “MVCEVK” for development. Pricing and availability have not been disclosed, but you may be able to get further information on DENX MCV page. The SoM will also be showcased at Hall 1, Stand 560 at Embedded World 2014, in Nuremberg, Germany on February 26-28, 2014.